Inside Idea LLC("InsideIdea")is a company managed by experts in the field of IT and Education. While offering products to small businesses, also provides web based services like hosting, portal and website designing, architecting small to large applications. Headquartered in Hoover, AL, USA, with an offshore development centre in Hyderabad, India, our clientele are spread across US and India currently. Our hardware infrastructure is secure, being maintained and operated in US and are PCI compliant. SkoolBag™ is a premier product catered to Educational vertical by Inside Idea LLC. At InsideIdea, we believe in building easy and reliable solutions for the educational institutions, empowering them to build a better tomorrow. We value our customers and are passionate about inventing and delivering the best solutions in the market, and delighting them by adding value to their businesses. It has been our ongoing effort to understand the current educational management needs and bridge the gap between the kids, parents and the educational institutions using a right mix of technology, research and leadership. 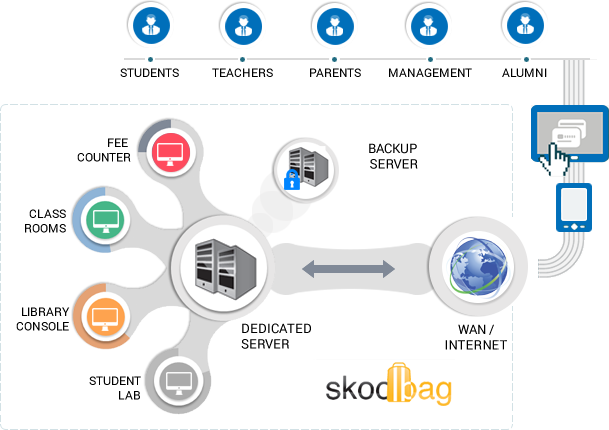 SkoolBag™ aims at developing educational vertical specific software products, providing cost-effective development of both industry-standard and customized applications for individual clients. Integrated SaaS solution - Ability to manage multi-campus independently under single organization. Provides a digital platform for day to day activities with robust Web2.0 technology features integrated in one system. Security - Enabling advanced double layer authentication for every user. Scalability - Our technology and architecture can scale to any size of the organization. Cost effective - Our web based software and less development costs puts us ahead in pricing. Management – Providing easy user interfaces to store, while managing and recording years of information. Portable – Easy portable to client side environments and platforms. Improved-access to real-time data, up-to-the-minute statistics and information, accessible from any computer, anytime, anywhere within school network and from secure internet connection. Reports - A variety of reports are generated and parents can avail and easily get access to their children’s day-to-day information like assignments, academic reports, and exam schedules at their finger tips. Alerts – Email and text messaging alerts for parents to keep a watch on the child’s progress. Emergency alerts, circulars are broadcasted onto the mobiles of subscribed parents, students and staff within network. Highly reliable software performance focused on quality, easy to use interface and customer satisfaction. Customer Support – Technically qualified experts to assist you on your queries and questions.